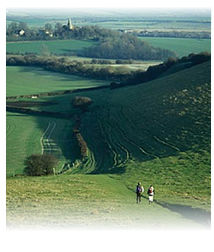 The South Downs Way runs for about 100 miles between Winchester and Eastbourne following the rolling chalk downs of Sussex and Hampshire. At Alfriston the South Downs Way splits with the bridleway route going inland above the Long Man of Wilmington hill figure, while the footpath route goes along the spectacular cliffs of Seven Sisters and Beachy Head. Both paths are easily accessible from Riverdale House. We have drying facilities for walkers and for an additional charge we are able to organise transport for walkers' luggage to the next overnight stop and packed lunches for walkers. Whilst it is possible to organise a walking holiday yourself, there are numerous specialist companies that offer tailor-made self-guided walking holidays, such as Footprints of Sussex (www.footprintsofsussex.co.uk) and Contours (www.contours.co.uk).